Steele plans an agressive PR push for his party. 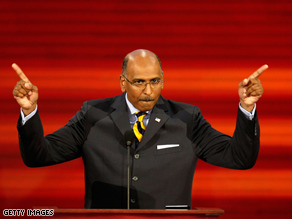 (CNN) - Republican National Committee Chairman Michael Steele says his party is going to launch an "off the hook" public relations campaign that will update the GOP’s image by translating it to "urban-suburban hip-hop settings." The new GOP leader told the Washington Times that the party’s defeat in states like North Carolina and Virginia made it clear they needed a new approach. Steele, who began a massive personnel overhaul at the RNC shortly after his election, said he has started meeting weekly with congressional Republicans. He said he’ll be gathering input from House and Senate leaders, not giving instructions - but criticized national Republican leadership’s focus on party unity as a top priority, saying the failure to devote itself instead to developing fresh faces had cost the GOP. Steele defeated a crowded field last month, including sitting RNC chairman Mike Duncan, to claim the party’s top spot. Mr Steele if you only knew how ridiculous you sound. Don't you get it.....You are a puppet. The GOP wants you to offset Barack Obama's popularity ...... I won't to let you know Playa .....It's not going to happen. Real recognize REAL. Get A Grip!!! As a republican, I am embarrassed. I don't understand where Steele is coming from on this–based on what I know of him this is completely out of character. What the republicans really need to do is not to "retool their message" but instead come back on point with their message–show how conservative principals can solve the problems at hand, admit to the failures of the Bush years and show how he and his cohorts were NOT conservatives, and YES, accept those democratic proposals that make sense (like, for instance, investment in light rail, etc.). It will be difficult in this climate where having principalled concerns with using overspending to fix a problem caused by overspending is called "obstructionism," but ultimately this is what is best for the country and for the GOP. TOTAL IDIOT! Just a Obama wannabe. Too bad he isn't. OMG, that's funny!! I almost choked on my coffee!